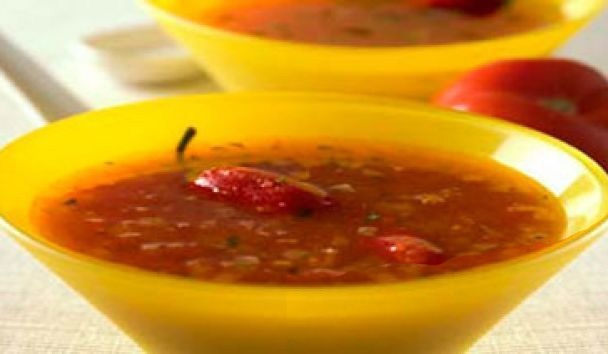 Tomato sauce "On the menu"
Simple and affordable tomato sauce with a touch of honey. - Tomato (size of a little more than the average) — 6 PCs. - Chili pepper — 1 PC. - Water — 1 tbsp. Make a Roux. Clean the ginger. Finely chop the parsley, chilli, ginger. Place all in a blender. Add 30 ml of water. Grind until a homogeneous mass. Add to the mixture 1 teaspoon of salt, one tablespoon of honey and spices to taste. Mix well. A pot of water to boil, put tomatoes for 30 seconds. Drain hot water and dial in a saucepan of cold. Clear tomatoes from the skin. Cut into small pieces the tomatoes and place in pan. Pour one Cup of water. Put on high heat, close the lid. Cook for 15 minutes. To skip the contents of the pot through cheesecloth or a sieve with a spoon while kneading the whole you got the pulp to merged lots of juice. In a clean saucepan, melt three tablespoons of butter. In melted butter, pour the resulting juice, add the previously cooked filling. Cooking with the lid open for 30 minutes until thick. The sauce is ready.